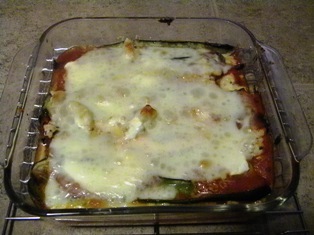 For the first time I decided to try using zucchini in place of pasta to make lasagna. I’m not sure why I never tried it before, but I finally decided it was time. I thought it turned out really good. Slice zucchini into 1/4 inch thick long slices. Place on a baking sheet and bake for 20 – 25 minutes until just slightly firm. In a blender mix the dry curd and the egg until it forms a smooth texture (it won’t be completely smooth, but the curds should be gone). Add a little water if it is not blending. Brown ground meat on the stove. Spread a cup of the sauce on the bottom of a 8 x 8 baking dish. Layer with zucchini slices to form one layer. Spread dry curd mixture over the zucchini. 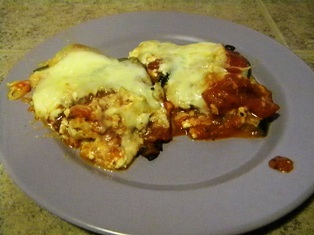 Add the ground meat, more sauce, and cheeses. Repeat layering until all ingredients are used. Make sure cheese covers the top. Cover pan with aluminum foil. Bake for thirty minutes. Remove foil and bake for an additional 5 – 10 minutes. An easy way to work with zucchini is to slice it the night before and lightly salt it and then roll it in 2 layers of paper towel. This draws the moisture out of it and makes the lasagna less watery. It comes out wonderfully in squares.